The Catalina 22 is a classic, one of the most popular one-design sailboats in the world. More than 15,000 boats manufactured for over 35 years make them readily available and relatively inexpensive. 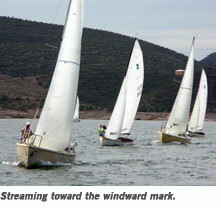 The older boats are as competitive as the newest ones, providing a level playing for everyone. We may not sail the fastest or highest-tech boat on the lake, but for flat-out, boat-on-boat racing, the Catalina 22 fleet at Lake Pleasant is awesome. Great competition is the name of the game—double digit numbers of boats wanting the “front row” at the line and six-plus boats converging on marks. Make a mistake and four or five boats blow by. Positions are constantly in flux. Deciding who to cover? Might as well flip a coin. Contact the Fleet Captain and let’s get started! Want to learn more about the fleet, ride along for a race, find a boat, or join the fleet? Contact the Fleet Captain and let’s get started!